It measures 3.5cm x 2cm x 0.5cm and is made of three layers of glass. A base layer of Black. 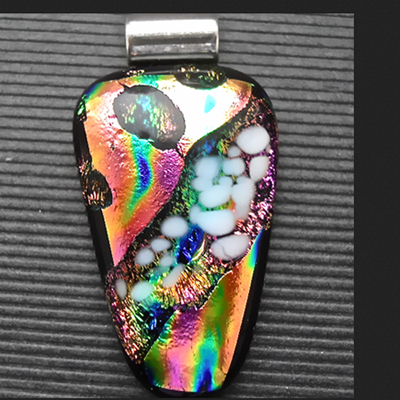 Then a layer of multi coloured Dichroic glass. Blue, Red, Pink, Green and some others. The final layer is thick clear glass with a Pinky Gold pattern which makes the pendant very chunky and shiny and three dimensional. It comes with a 16" x 1mm Sterling Silver chain in a nice Black card gift box.